By carefully controlling the position of an atomic-scale diamond defect within a volume smaller than what some viruses would fill, researchers have cleared a path toward better quantum computers and nanoscale sensors. They describe their technique in a paper published in the journal Applied Physics Letters, from AIP Publishing. 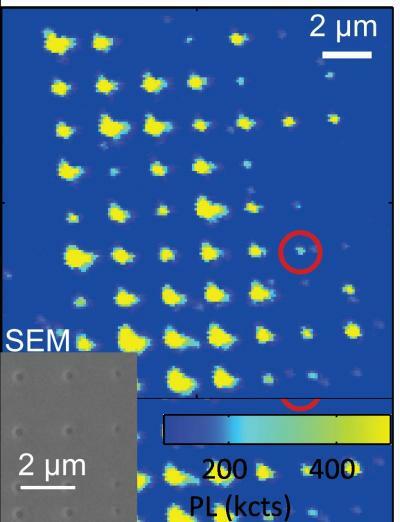 David Awschalom, a physicist at the Institute for Molecular Engineering at the University of Chicago, and his colleagues study a technologically useful diamond defect called a nitrogen vacancy (NV) center. NV centers consist of a nitrogen atom adjacent to a vacant spot that replaces two carbon atoms in the diamond crystal, leaving an unpaired electron. Researchers can use a property of the unpaired electron known as its spin to store and transmit quantum information at room temperature.